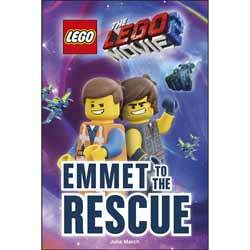 Blast off with Emmet on an epic mission. Help him search for his missing friends. Meet Rex the space pilot. Can Rex help Emmet travel through space to find his friends...? Emmet To The Rescue is part of DK’s reading programme, available in four levels to help every child progress and become a confident reader. Aimed at children aged 4+ (level 1) Emmet to the Rescue features age appropriate vocabulary and repetition to engage young fans and build their literary skills. Join Emmet, Lucy, Batman and Unikitty on their new adventures, with exciting images, clear sentences and a fun quiz to help build confidence and develop comprehension skills. For parents struggling to get their young ones to engage in reading, The LEGO Movie 2 range of books is a perfect way to get them started. If your little one has seen the movie then the images here (and general story) will be sure to hold their attention. It's a bright, bold and beautiful looking book that is perfect for bedtime reading for the youngest reader in the house.